Queen Victoria is a figure who does not want for biographers, and when we conjure an image of Victoria, most people have a sense of a short, stout woman, dressed in black and looking out of a sepia photograph looking pretty miserable. Some of us may have a further sense of Victoria, as a complex woman who was - until a few days ago - the longest reigning monarch ever in Britain. 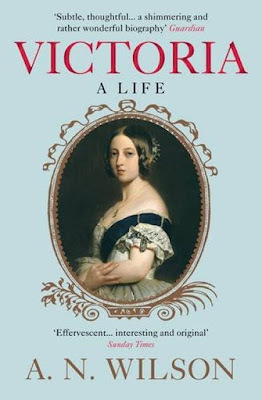 The benefit of A N Wilson's new biography is that he approaches the subject from a middle ground - an assumption that the reader already has a certain depth of knowledge of Victoria - which is refreshing and allows for an insightful and flowing narrative. Starting from the context of Victoria's birth to her final moments at Osborne House, Wilson treats us to a story which, relying on some previous understanding of Victoria's life, brings some more interesting tidbits out of the woodwork. I knew, for example, that Victoria's first name was actually Alexandrina - but I did not know that during her early childhood she had been called 'Drina' by her relatives and only later became known as Victoria. Wilson is also able to scotch some of the traditional myths of Victoria - some of which she wove around herself - including that of the miserable, lonely childhood at Kensington. As Wilson gently reminds us, Victoria did suffer at the hands of the 'Kensington' system and Sir John Conroy during her teens, but most of her childhood was actually peopled by half siblings - in the form of her half brother and sister from her mother's first marriage - and the devoted love of her mother, the Duchess of Kent, something which the adult Victoria failed to acknowledge and recognise. As we follow Victoria to her accession and beyond, Wilson is able to branch out from the family saga - namely Victoria and Albert, their children, and the sagas throughout her life with the likes of John Brown and the Munshi - to also give a broad overview of the politics of the period. We are introduced to the successive prime ministers, their policies and the wars of the empire. These are covered on their own merits and also through Victoria's reaction to them, but they never feel intrusive on this personal biography. I personally felt that I got a lot more out of this overview of the political scene than I have ever done with previous books about Victoria herself. Wilson's biography is completely chronological but occasionally allows for reflections on the future, which allow us a greater understanding of the events he is speaking about. These diversions enhance the narrative rather than detract from it - especially in a family as large as Victoria's, it is often important to know where relatives come from, and where in the future they are going. Towards the end of the book, nothing could be more interesting that the tensions between familial loyalty and national pride which beset the likes of Wilhelm, the German Emperor and Victoria's grandson. This book is a long one, but it does not feel it; the writing is light and readable, whilst maintaining a sense of authority, excellent research and a broad approach. Wilson is affectionate towards his subject without being sycophantic; he recognises all the faults in Victoria as a woman and a sovereign whilst still acknowledging her as a great Queen. Highly recommended.